January 2012: Uses of algae II. Making energy, which is typically converting one kind of energy to another, is usually only the first step in doing what we want to do. The next two major steps are transmitting the energy from one place to another and storing the energy until we need it. Batteries play an important role in energy storage, and many people in government and private funded research and development groups are working on making better batteries. This essay is motivated by an article in the journal Science: "A Major Constituent of Brown Algae for Use in High-Capacity Li-Ion Batteries" by Kovalenko et al. [Science, v334, pg 75, 7 October 2011]. The lithium-ion rechargable battery is at present the most popular type for high capacity-low, weight uses. 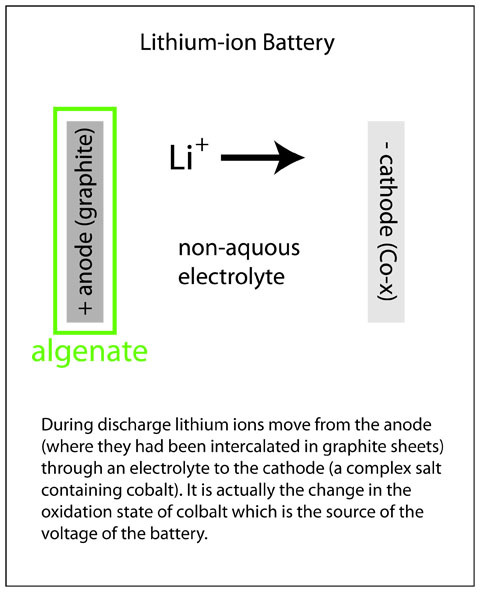 As seen in the diagram on the right, current is generated by the migration of lithium ions from a graphite anode to a cobalt containing cathode (an oxidation state change in the cobalt actually provides the energy). Graphite consists of parallel sheets of carbon atoms, and the lithium ions are intercalated (inserted) in between these sheets. As lithium leaves the graphite sheets there is a volumn change, and during repeated discharge and charge cycles this can degrade the anode. The Science article describes the use of alginate gels extracted from algae as a binder to stabilize the carbon anode so the battery can be cycled many times, a major design goal for any rechargable battery. This section on the basic properties and chemistry of algenates (polysaccarides extracted from algae) is sandwiched between the two sections which describe their uses because I didn't want to get into theory before you learned about at least one use. The algenate polymers occupy (immobalize) a large volume so the viscosity of the suspension is large. In many areas of the world algae are eaten as food. Algae (sea weed) goes well with sushi, and I like to eat it in many other dishes as well. However, the major use of algae in the United States and Europe is not as recognisable seaweed, but rather as a source of algenate thickeners. The original ice cream was made with (only) cream, and it has an unforgettable taste as well as a thick texture which is an important part of its appeal. But cream is expensive, and since it is rich in lipids (fats) it spoils quickly if not refrigerated; even at low temperatures it has a modest shelf life. Algenates are cheaper and get the job done. Algenates (and similar polymers) are appealing to the "Food Engineers" who design an increasing proportion of our foods. It's relatively cheap, doesn't separate into different phases, and is more resistant to microbrial decay. Long shelf life is very important to modern food distribution practices in the United States and other "Advanced" countries. Extracts of agae have a long history in bacteriology. The original (and still fundamental) test for bacteria is to spread the sample on an agar gel that also contains nutrients for bacterial growth. 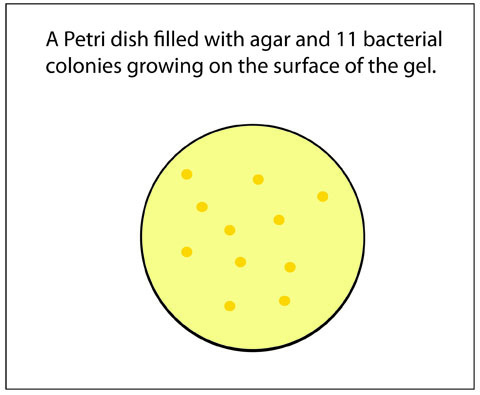 Each bacterial cell grows on the agar surface and produces a colony that can be seen with out a microscope. You might think any gel could be used in a Petri dish, but if you try gelatin (or "Jello",) you will discover that the entire dish of gel becomes a liquid before you can see any colonies. The problem is that gelatin is a protein, and most bacteria secrete enzymes that degrade proteins. Thus, the important property of agar is that most bacteria do not secreate enzymes that can break it down. Molecular biologists, aka, biochemists, often need to separate large molecules, e.g. DNA fragments, according to size. A common technique is to apply a sample to one edge of an agarose (a kind of agar) gel slab, and apply an electric field to move the molecules with a velocity inversely proportional to their size. After a few dozen minutes, the various DNA fragments are spread along the gel and can be characerized.